Searching for suitable social media management tools often brings you to Hootsuite. It is probably the best-known tool out there. Is it best for you as well? Personal preference based on personal experience tells you best but ain’t nobody has time to try all of the tools right? Let’s find out whether Hootsuite or Kontentino fits your needs better. While choosing your tool you need to know where you want to post your content. Hootsuite supports social networks: Facebook, Instagram, YouTube, LinkedIn, Twitter, Pinterest with the possibility to add other via add-ons, such as WordPress, Tumbler, Blogger, Reddit (some of these are considered Hootsuite premium features so you might have to pay extra for them). 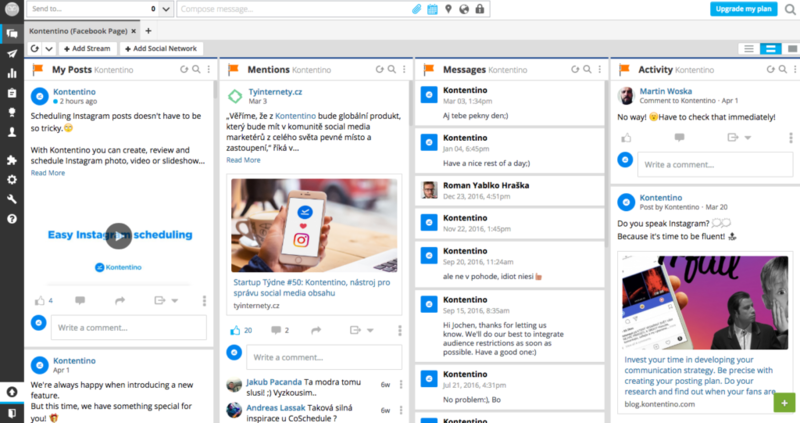 Kontentino supports social networks: Facebook, Twitter, LinkedIn, Instagram and Pinterest. The Hootsuite scope is wider so it has an advantage here. However, Kontentino is more brand and agency focused and new/trending social media networks are always added, especially the newest post formats like 360° photos or video carousel. You have to enjoy working with different tools while doing your daily routine at work. That’s why ease-of-use is an important criterion. You’re going to spend hours with your tool. Developers understand that so they have to create a tool that is intuitive and eyesome, with continuously improved functionality. Visual attraction really is a personal preference. Both tools are doing great work in this case and pointing out the winner here would be silly. Post scheduling is one of the main perks of using a social media tool. Scheduling should be easy and include a collaboration and approval workflow. Both tools can do this but there are few things that are different. Hootsuite has an option for superfast post scheduling with just a few clicks, it’s not that complex but it’s efficient in some cases when you need very fast and simple posting. Also, it can automatically set the suggested time to publish your post based on an algorithm. Approving process is complex and offers sophisticated settings. Kontentino, on the other hand, doesn’t offer superfast scheduling but includes live post preview for all post types, checkboxes, and an option to add colorful tags to your posts for better content balance. Moreover, all communication and feedback are happening right next to the post with separated internal and client comments. Another nice perk is that Facebook posts scheduled with Kontentino are exported to Facebook as scheduled drafts. This way you can also schedule boost for particular posts before they are published. Supporting all post formats: Clear as it is. Kontentino supports all Facebook formats. You can create video carousels, 360° photos or even multiple images Instagram posts. This applies to all social media post types on Instagram, Twitter, and LinkedIn. Live post preview: While reviewing a post, you can see exactly how it will look on a specific platform. Colorful tags for content balance: You can create and add tags with different colors to keep control over your content topics and themes. This is a perfect way to have content balance under control. Post requirement checkboxes: Set up checkboxes to remember important rules or guidelines your posts should meet. Schedule Instagram posts directly from Kontentino calendar. Instagram posting is similar to Hootsuite’s. You can post photos and videos directly to your Instagram business profiles. Collaboration and approval workflow: Kontentino offers you an option to involve multiple people with different roles to work on your posts. You can set graphic designers to work only on the image or video. These different roles are part of a complex but intuitive collaboration and approval workflow feature. While some people work on posts, others (art directors, clients…) are able to approve it, give feedback or send it back for a rework. Streams: Hootsuite’s default page offers the fully customizable board of streams, you can see your posts, mentions, messages of any of your managed accounts in any order you want. Campaigns: You can start predefined campaigns or make your own one to involve your audiences into the company’s activities. Create an Instagram contest to power your feeds with hashtags! Fast posting: Hootsuite takes just a few clicks to completely schedule your post. Schedule posts without a calendar in chronological order. Direct Hootsuite Instagram posting is available for business accounts. Hootsuite Instagram posting for personal accounts works through the Instagram application. Hootsuite will provide you with a reminder notification at the time of the publishing, and you have to manually publish the post. Hootlet: Another time saver. Hootsuite’s browser extension will ease your re-posting. Have you just got onto an interesting article you would like to share? Just click on the button and share the link with your social media audience. Analytics: Hootsuite gives you the option to generate different reports, deeper analytics come with an extra price for Instagram. App: Some say a desktop is dying. Having a mobile app is super convenient for users. Thumbs up for Hootsuite’s mobile app. 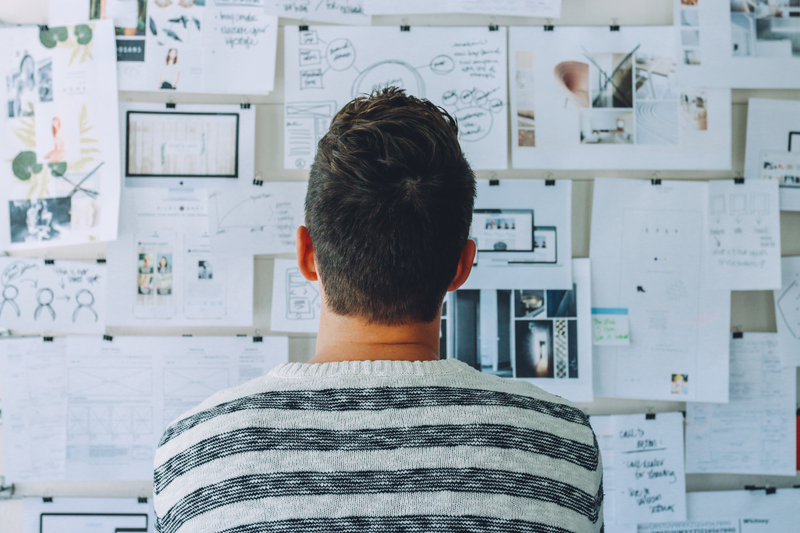 Blog: check out the articles on the Hootsuite blog. This is an important part and carefully weighed criterion when it comes to making a final choice. You have a budget, you have needs. When you open the pricing section for both tools you see different prices for different plans. Let’s make this clear. Hootsuite asks you to pay extra for certain features that are part of the Hootsuite premium plans. On the other hand, Kontentino offers these features with regular plans. Other big difference is the number of users that have access to the tool. Why is that? Kontentino’s intention is to grant access to clients of each company that is using it. For example, when you are an agency that takes care of social media accounts of many different clients, you want to give them access to review and approve particular scheduled posts. This is the reason why the number of users is set higher than it is in Hootsuite and sites similar to Hootsuite. For 1 user, Hootsuite costs 25 €/month. 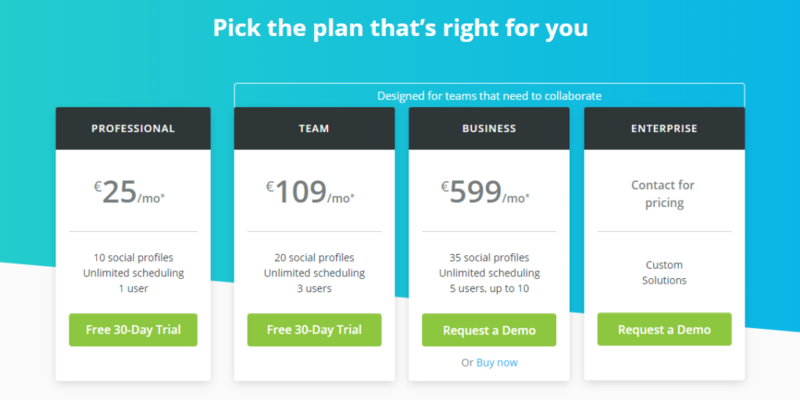 Hootsuite pricing for teams that need to collaborate starts at 109 €/month for 3 users, 599 €/month for 5-10 users and they also offer custom solutions for enterprises. Hootsuite’s pricing depends mainly on the number of users that can be added to a plan and the number of social media profiles managed. Also, some more advanced analytics features are only available with the more expansive plans (that could be considered Hootsuite premium). Keep in mind, that you can go with some of these plans but it’s not strict. Everyone has different needs so asking for an individual plan isn’t unusual. But be aware, some hidden prices can surprise you too. You can check Ian’s blog to learn more about these. Both tools have a very similar focus. One way is to decide based on the unique features that you need for your business purposes. Another option is to make a choice based on your profile. For very small companies that do not have many social pages, only one person to manage them and require just basic scheduling: pick Hootsuite. For larger brands and agencies which need to coordinate multiple people, need to set approvals, see categories and content balances, the budget for posts and don’t have a lot of money to spend on tools: pick Kontentino. It will satisfy all general needs and won’t hurt your company’s wallet. Have you chosen which tool is better for your needs? Let us know in the comments. 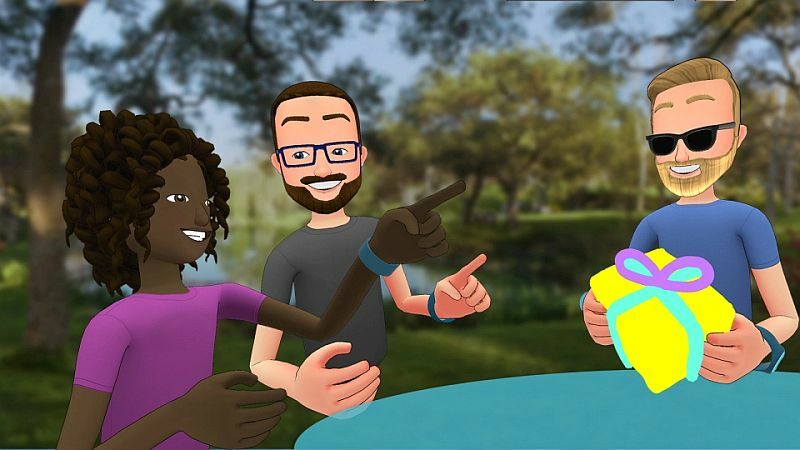 F8: Is virtual reality going to replace real life?